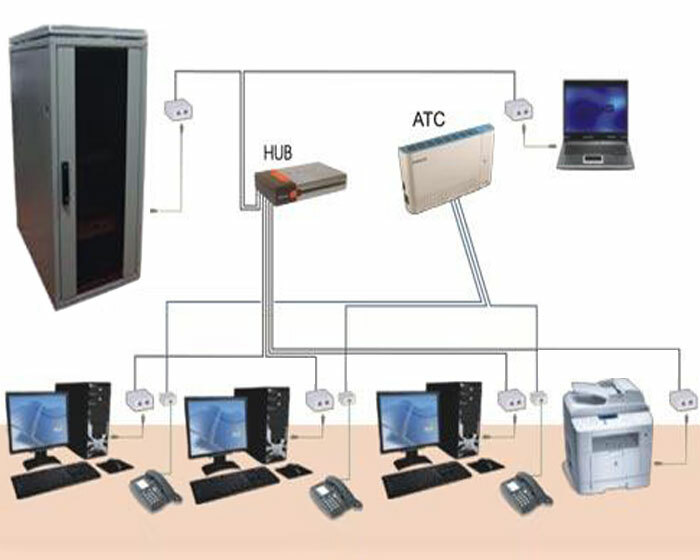 HIGH IINFORMATION TECHNOLOGIES to the clients предлогает network telecommunication decisions which include cable, волоконно optical and безпроводные the networks providing an information exchange of internal and external systems of the client. Our service has the complex decision which includes consultations, designing, a lining and service. Networks will be designed, established and will be supported according to wishes of the client. HIGH IINFORMATION TECHNOLOGIES предлогает: Network decisions on the basis of a symmetric cable, network decisions on the basis of an optical cable (SM un MM), decisions on a basis безпроводных networks (radio LAN). Cable networks: corresponding EIA / TIA 568A to standards, we use CAT 5/5E or ISO 11801 classes D/D + cable components (cables, connectors, panels) with speed of data transmission to 100 MHz which are necessary for transmission the data. HIGH IINFORMATION TECHNOLOGIES uses структуризированные cable systems leaning: the standardised environment data transmission (cables) and cable topology; the standardised interfaces (connecting contacts) for physical connection оборудонания; supports cable systems of different manufacturers. The architecture dependent on the manufacturer is used opened, not; systems are completely projected and established.